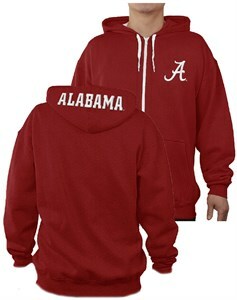 Stay warm when you show off your College pride when you put on this Alabama Crimson Tide Mens Full Zip Peak Sweatshirt made by E5 Sports. With its Left chest and hood back high quality tackle twill embroidered graphics this hoody will let everyone know what team you cheer for . Made in Crimson from a mid-weight 7.5 oz. cotton/poly fleece material with a loose fit body that gives you room for layering; this NCAA Hoodie can go to the game, the gym, or just anywhere you want to show your collegiate pride. Features include a soft inner body, a color contrasting hood with internal draw cords, a front pouch pocket, a full front color contrasting zipper, and ribbing on the cuffs and hem.